Lane filtering… lane splitting… lane sharing… different people call it a different name. It is the act of riding a motorcycle in a slow speed between two rows of slow moving or stationary vehicles heading in the same direction. All of us riders have done it, all of us drivers have seen riders doing it. In fact, for many years I was stuck daily in Sydney’s peak hour traffic and was jealous of the riders splitting lanes around me. Lane filtering is legal in most states in Australia, however, the rules are different from state to state. * It is illegal to lane filter: next to the kerb, next to parked vehicles, or in school zones. * You must comply with all existing road rules when lane filtering. This includes stopping before the stop line at a red traffic light or stop sign, never in front or over it. It’s hard to predict how drivers will react when they see a motorcycle filtering. It’s clear though that some drivers see the benefits and move out of the way a bit, while others frown upon the practice and will not do a thing that may assist the rider. It is true that lane filtering can save time. And none of us want to sit in traffic. But lane filtering has other advantages too. For example, it reduces congestion by removing motorcycles from the traffic flow. With more and more motorcycles on the roads this will have a bigger positive impact on traffic congestion. But the most important advantage: lane filtering is safer for riders! So why is lane filtering safer? There are a number of reasons. 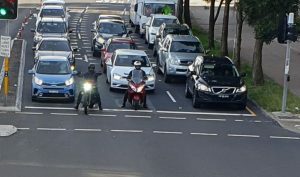 A motorcycle sitting in traffic is vulnerable. Being a smaller vehicle and in such close proximity to other vehicles it is hard for a rider to be seen. In addition, drivers in frequent stop-start traffic get impatient and distracted. These two factors are the biggest contributors to rear-enders involving bikes. Moving to the front of the traffic queue allows a bike rider to start ahead of the traffic behind him, thus reducing possible contact with other vehicles. It also enables the rider the freedom of choosing the best and safest path into an intersection. This is supported by studies conducted on lane filtering. In 2014 the University of California Berkley (UCB) published a study done in conjunction with the California Highway Patrol. 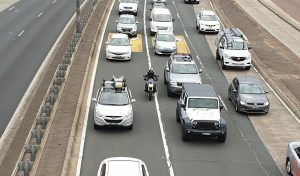 The study focused on lane filtering and it found that compared with other motorcyclists, lane-filterers were less likely to be rear-ended and less likely to suffer injuries and fatal injuries. You can read the full study here. 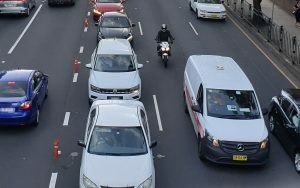 A trial conducted by Transport for NSW prior to introducing the lane filtering laws concluded that when lane filtering is done under the set conditions it is safe. But it’s not all good news. There are also possible risks involved with lane filtering. Unexpected opening of vehicle doors, vehicles changing lanes unexpectedly and accidentally touching cars’ mirrors, all can happen when a rider is so close to other vehicles. In addition, some drivers are not “motorcycle aware” and do not expect to see a bike showing up right next to them in a traffic light or slow traffic. These drivers may be surprised and react in an unexpected way. There is no question that lane filtering, when done safely and legally, has many benefits. And benefits that all road users can enjoy. The ease of congestion, the environmental impact, the time saving, these are all great incentives to encourage us all to embrace lane filtering. But no doubt the biggest benefit is the safety aspect for the riders as lane filtering reduces accidents, injuries and fatalities. We can managed the risks with better education and awareness campaigns, highlighting the benefits everyone anjoys. The safety aspect should be made the centrepiece of any such campaign.